Luke Bozier responds to Shashank Joshi's Telegraph article last week in which he outlined why he thinks Libya could be the last ever Western-style intervention. I wrote a few weeks ago for Left Foot Forward that the BRICS countries, those five nations flagged as the large emerging economies of the 21st century, must also realise the moral duty they have to take part in humanitarian interventions. Brazil, India and China all abstained from the Security Council resolution supporting NATO’s action in Libya in March, and of course they didn’t contribute a single special forces solider or fighter jet to Libya’s rebel-led liberation. Yet those nations will benefit from a world with fewer dictatorships; their companies will no doubt be looking at the expanded commercial opportunities which a newly liberalised Libyan economy will present. There’s not just a commercial rationale for BRICS (and other emerging) nations to support humanitarian intervention – there is a moral imperative on all countries to act when it’s clear that a regime intends to brutally crack down on democratic uprisings. Obviously, that argument, when taken in the context of dictatorial China or Russia, might sound naïve. But actually, all countries want to be seen as benevolent, and all countries have certain responsibilities under international law to protect citizens when they can’t protect themselves (see ‘Responsibility to Protect’). Besides, there’s a huge difference between the way Gaddafi treated his people and the way China runs itself. I’m an eternal optimist with most things, and I think it might be worth a try next time round to be more pro-active in bringing Beijing, Brasilia and Delhi on board at the very beginning, as key partners, in a Libya-style intervention. It might sound crazy today, but in the future it won’t seem so mad that Brazilian or Indian planes might fly sorties alongside British, French and American planes. All it takes is an alignment of interests, a gentle reminder to those countries they have moral obligations too, and the correct resources in place on behalf of those countries to make this happen. We should also remember that emerging powers are just that: emerging. Development of a nation from third world to first world power with the willingness and resource to intervene in a foreign land is something of a journey. It’s like the economic growth that those countries have witnessed; you start at a certain place, with an end goal in mind, and realise it takes baby steps reach that goal. Humanitarian intervention is seen as a typically Western activity primarily because it’s the Western nations like Britain, France and the United States who have historically had the resources to carry out those interventions in the past. The moral imperative has only recently become an important part of Western foreign policy. Previously, foreign policy was purely interest-led. Leaders like Blair, Clinton and (gasp) Bush turned the moral imperative into a national interest, by being prepared to put military might behind the lofty goal of democracy and freedom for all people, everywhere in the world. In countries like Kosovo, Sierra Leone and Afghanistan, it’s impossible to argue that the West was intervening to plunder oil or mineral reserves; those interventions happened out of a willingness to either protect people from slaughter or to remove dangerous and violent governments. So if it took centuries for Western nations to make their foreign policies, at least in part, driven by moral concern for human beings elsewhere, why is it right to assume that emerging powers including BRICS nations will never reach that same conclusion? Humanitarianism is universal – there’s not a human on Earth who could remain indifferent after watching the video footage of burned bodies in a Tripoli suburb last week. Brazilian, Indian and South Africa citizens feel no different to British, French or American citizens when presented with such brutality. How long until they too insist their governments use their considerable military assets alongside Western partners? 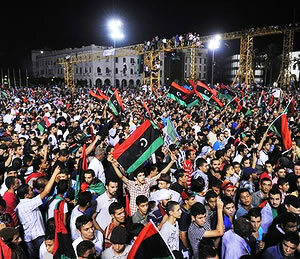 So the view that Libya could be the last ever Western-style intervention, whilst popular, is naïve. Emerging powers, particularly democratic countries like Brazil and India, will eventually reach the conclusion that genocide is unacceptable and that populations pushing for the democracy they enjoy in their own countries sometimes need help and protection from the international community. I’m confident that it’s just a matter of time. But in the meantime I would like the Western powers to remind emerging leaders of the future their responsibilities are moral as well as just economic. ‘The moral imperative has only recently become an important part of Western foreign policy’.Actually,it began with the US coming to the rescue of Europe in WW11.The irony is that NATO is a defensive alliance,and that the moral imperative somehow escaped Spain,Portugal,and Turkey. And yet Syria is not worth fighting for, why oil no good. You are assuming that every country believe in neo-Liberal intervention. Be careful. The hunted shall one day become the hunter. Robert, as David Cameron put it, just because we can’t do everything, doesn’t mean we don’t do anything. And, through the international community, Britain has been very critical of what’s going on elsewhere, but I simply don’t believe all this about oil.